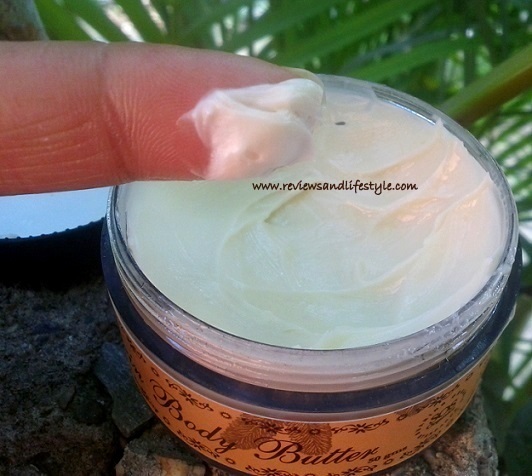 I am back with the review of another delicious body moisturizer, and this time for dry skin. 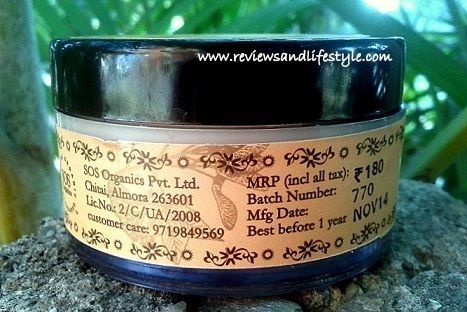 I first discovered this SOS Organics Mandarin Body Butter in Summers and had been waiting since then to try it out. Finally bought this body butter along with a lot of other products and organic food items from sosorganics.com. 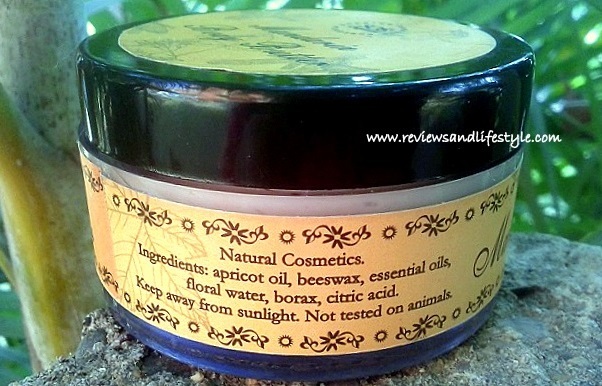 Body butters are a type of skin moisturizers. These are heavier than creams and lotions, and therefore provide excellent moisturization to dry and very dry skin types. However, depending on the type of precious oils used in a body butter, even normal and oily-skinned people can indulge in these. Made in India, at Almora, in a clean pollution-free village in the mountains. (As found on their website) An Uplifting rich body cream with a lively, cheerful and sensual aroma, enriched with mandarin and cedar essential oil that will keep you feeling fresh all day long. Rich and hydrating, this body butter is excellent for dry skin. Made with rare Himalayan butter tree oil and enriched with healing cedarwood essential oil and uplifting mandarin essential oil. Cold pressed wild apricot oil, Himalayan butter tree oil, beeswax, Essential oils (cedarwood and mandarin essential oils), Floral water, borax, citric acid. A very simple ingredient list with no fancy chemical names, makes it a truly worthy product especially for those who don't like to feed chemicals to their body and reap nature's goodness. 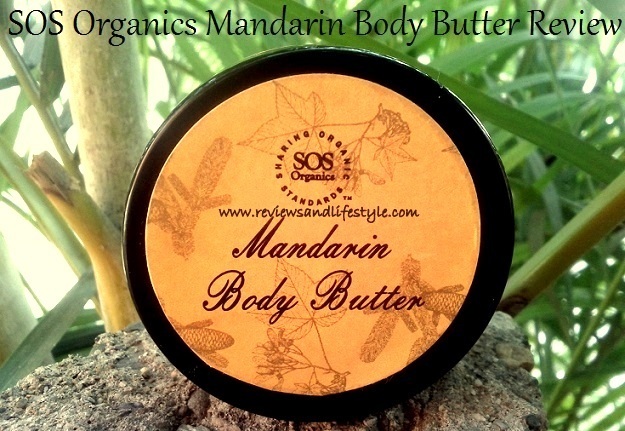 Orange is one of my favorite flavors apart from vanilla, and this body butter contains mandarin essential oil. Mandarin is a type of orange (You can read more about it HERE). This is technically my first body butter and I was expecting it to be a luxurious whipped cream with a rich delicious tangy fragrance. However, this body butter was very different from my expectations. When I removed the lid, I smelt something bitter rather than delicious and my first thought was could they have used bitter almond oil in it by any chance. 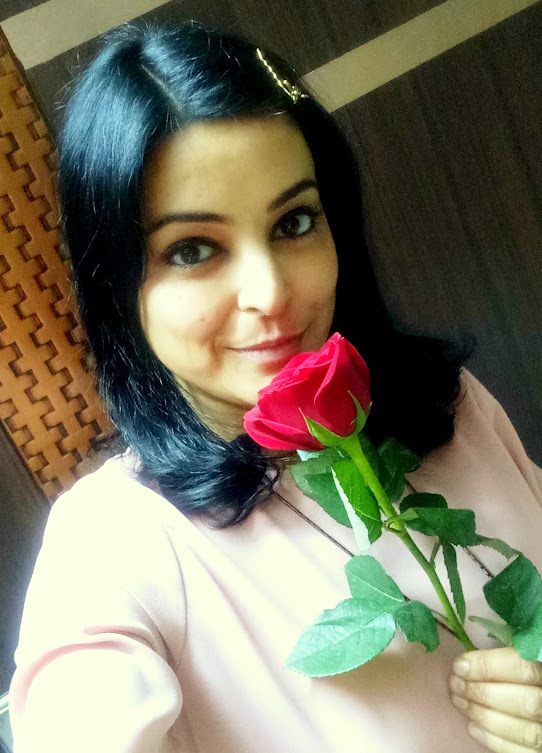 I wrote to SOS Organics and their owner Amrita told me that the bitter fragrance is of wild Apricot oil which is very good for the skin. This body butter feels thick and greasy on applying, but once you rub it into the skin, it melts with body heat and spreads easily. You need to apply it as dots on the skin and massage the dots in circular motion. It forms a thick layer on the skin and takes a good 10 minutes to absorb nicely. It will leave grease marks on your cellphone or other stuff for at least 30 min, so it is best applied at night or when you want to pamper yourself with a nice massage. All their creams are thick and smell bitter initially. I tried whipping the creams to make them thin and light, however, this caused the oil to separate from the thick creamy part. So do NOT whip or stir this body butter. All SOS organics creams and scrubs contain coldpressed wild apricot oil, which smells bitter. This mandarin body butter smells bitter only in the tub. Once you rub it into skin, a sweet delicious mandarin/orange aroma arises. A little more massage, and you can smell a woody fragrance, just like a woody spicy perfume, which probably comes from the cedarwood oil or the Himalayan Butter tree oil. I love the way it smells and the fragrance feels very mild and soothing. However, anyone passing by the room or entering the room from outside can clearly smell a delicious sweet orange fragrance spread in the room. While applying, it makes my palms ultra soft. It actually heals damaged dry skin. It softens the hardened skin on my knuckles and makes my nails look pink and beautiful. It makes my feet and heels soft. For best results, apply after bath or at night. I love using it mainly on hands, feet and torso. I use body lotions only on my arms and legs and avoid chemicals based lotions on my torso, where they can be absorbed directly into your system. The quantity is just 50 gms so you cannot afford to apply it on your entire body or you will finish it within a month. However, it's a very affordable body butter as compared to other high-end brands. Buy one tub and enjoy in winters as the shelf life is low and it won't survive summers. 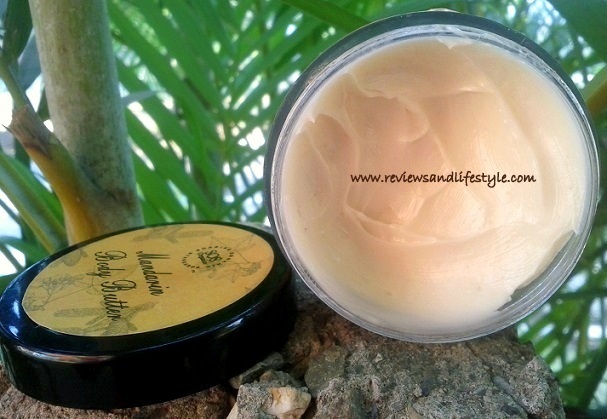 There are no chemicals/preservatives in this body butter and the ingredients are of organic standard. You can use it for a luxurious weekly pampering session and use your regular products the rest of the days. If you have dry or very dry skin, this product is worth trying. If you want to buy any other products from this brand, try out their Natural Orange Spice Body Scrub and Peppermint Foot Scrub. Thanks Megha, yes I saw your review for Himalaya body lotion. For the first time, I too am surrounded by many Himalaya products. Have tried their face lotion recently and it's good. 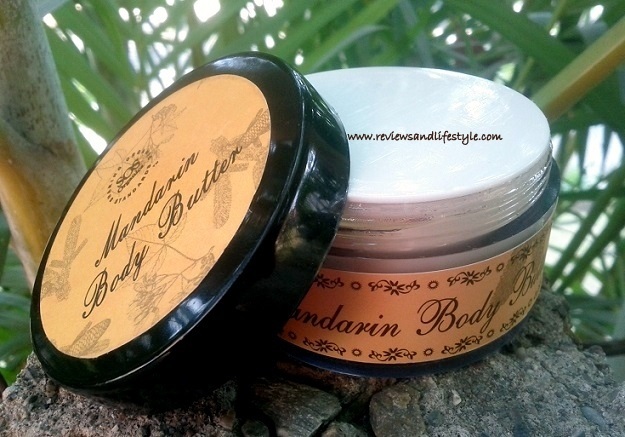 This mandarin body butter was a refreshing change and something new to try and their scrubs are awesome. Didi, my skin is dry and it gets drier in winters because of the weather and my hypothyroid condition. She uses unrefined and raw cocoa butter which helped my skin stay moisturised. I feel her body butter is too thick to be used in winters if you know what I mean. 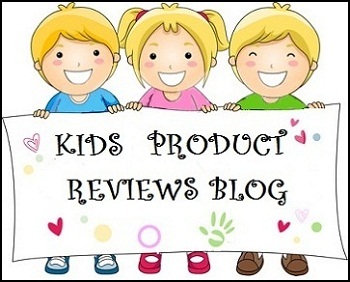 Thanks for reading and liking the review :) Actually I had placed a huge order with SOS organics at that time and bought most of their products to try. Apricot Oil had a bitter smell and was moisturizing BUT it was comedogenic. It blocked skin pores and created bad painful red acne on my back and upper arms. In fact all their creams etc have this same oil. I bought their face creams also, all failed. THe oil separated from the cream and it became like mud and water, like all oil on top of the jar and white creamy thick stuff at the bottom. As for Shampoo bars, you should not use any. Shampoo bars are just soaps and soaps have high pH which will open up the cuticles of your hair and would fluff up the hair. Opening of the cuticles is the same thing that Ammonia does. Cuticles are the outer protective layers on our hair. If they open up, the inner layer of our hair gets exposed to damage. Hence shampoo bars and any shampoo soaps are really bad for the hair. They also leave a bad residue on the hair causing a lot of tugging and hair fall. If you are looking for a moisturizing oil for your skin, you can use Sesame or Avocado. Both are good and do not block pores. We had launched our oils in Feb this year. You can email me for price quote. The best time to use oils in summers is after bath. Remove the excess water from the body with the help of your fingers and hands without using towel. Then take a few drops of oil and apply on semi wet skin. Will keep the skin super soft and moisturized. Works best like this in winters also giving you smooth glowing skin.